It’s back and better than ever! For 24 years, Animethon has brought Japanese culture to Edmonton, making it the longest running fan-convention in Canada, drawing over 9,000 attendees from across Western Canada. We look forward to Animethon every year, especially as it’s hosted by our neighbour, MacEwan University. In honour of this milestone, we will be offering a 10% discount to all conference attendees (when you show your pass at Noodle Bar by Nomiya)! 1. Anime has been around since the early 1900s. Believe it or not, anime did not begin with Sailor Moon or Pokemon (they were late to the party, originating in 1992 and 1997). Anime has been dated back to 1907, potentially even earlier – records of this time are spotty at best – as an extension of theatre. While Osama Tezuka is known as the anime expert, three men are thought to be the anime originators: Katsudo Shashin, Junichi Kouichi, and Seitarou Kitayama. Check out pre-Tezuka anime here (warning: we are going old school: no colour, no sound). 2. Oh, Mickey, you’re so fine, you’re so fine… you created Anime? Yes, we can thank Mickey Mouse for the happiest place on earth and for anime! The master of anime, Osama Tezuka (we have a feeling this guy is going to pop up a lot), was inspired by Disney so much that it’s reflected in his own work — word is Bambi and Mickey Mouse were his favourite. While Tezuka influenced generations after him, the original Mouse influenced him! His creation, Astro Boy, was drawn to look like a Disney character. Is it just us or does this boy have some big “Bambi eyes”? ..and you thought The Simpsons were killing it with 618 episodes in 28 seasons. Created in 1969, Sazae-san is the longest running anime. If you think these 6-minute episodes don’t count, there’s always Manga Nippon Mukashibanashi, which has over 1,400 25-minute episodes. Netflix, you have met your binge-worthy match! 4. Anime with a side of.. pizza? Anime sells its captive audience to numerous advertisers – how better to sell a product than to place it in anime? The Japanese don’t shy away from product placement like we so often do here in North America, but rather they embrace the potential revenue-generating partnership. By partnering with well-known brands, products are placed in anime, while the brand will promote the show on their product. A quick Google showed us Pizza Hut and Code Geass are feeling the cheese for one another. We’re not kidding. More paper is used to print manga (printed version of anime) than toilet paper. In Japan it is very popular to recycle manga by simply leaving it on a table or bench for another person to pick up and enjoy. Now, this is something us Canadians need to incorporate in our anime culture. Sustainability for the win! While beauty may be in the eye of the beholder, talent is in the palm of the hand. The majority of manga is still drawn by hand because if it ain’t broke, don’t fix it! This seems to be the mantra of Japanese manga creators. We found some pictures of the desks of manga creators, (some like it clean, some like it cluttered) – snoop here. Anime is a culture of its own, and we can’t wait to share in with you at Animethon 24 this year, (we hear the costumes are going to be over-the-top)! Stop by and show us your conference pass from August 11 to 13 for your 10% discount, and to share the Animethon spirit. 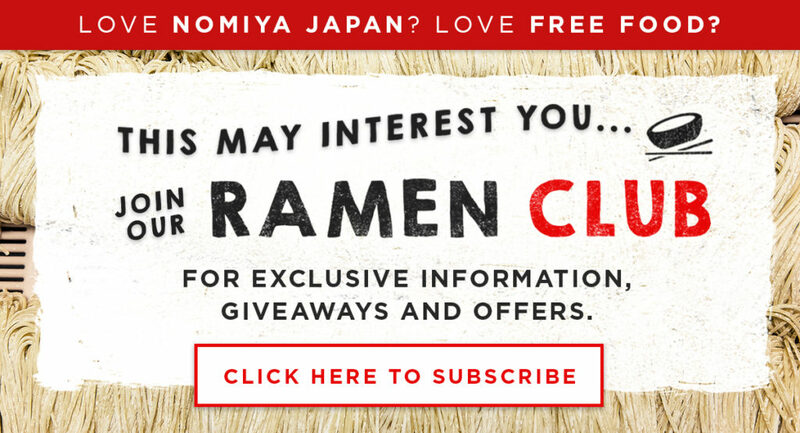 Be sure to keep in touch and subscribe to Nomiya’s Ramen Club newsletter so you don’t miss another deal, and did we mention you’ll be entered for a chance to win a free bowl of ramen? It’s a pretty hot deal!